Original unrestored 1959 BMW Isetta 300 in good mechanical condition. The car starts drives and stops as it should and can be enjoyed as is for years to come. The car has its factory 298 cc single-cylinder 4-stroke engine and 4-speed manual (with reverse). 82734 kilometers on the odometer and Danish title and registration dating back to new in December 1959. The BMW Isetta 300 is increasing in prices and it is becoming more and more difficult to find original cars in this condition. In 1956, the government of the Federal Republic of Germany changed the regulations for motor vehicles. Class IV licenses issued from that time onward could only be used to operate small motorcycles and could no longer be used to operate motor vehicles with a capacity of less than 250 cc. 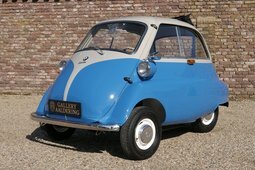 At the same time, the maximum capacity allowed for the Isetta's tax category was 300 cc. Class IV licenses issued before the change in the regulations were grandfathered and allowed to be used as before. This change in regulations encouraged BMW to revise their Isetta microcars. In February 1956 a 300cc engine was introduced. The engineers enlarged the single cylinder to a 72 mm (2.8 in) bore and 73 mm (2.9 in) stroke, which gave a displacement of exactly 298 cc; at the same time, they raised the compression ratio from 6.8 to 7.0:1. As a result, the engine power output rose to 10 kW (13 hp) at 5200 rpm, and the torque rose to 18.4 N⋅m (13.6 ft⋅lbf) at 4600 rpm. The maximum speed remained at 85 km/h (53 mph), yet there was a marked increase in flexibility, chiefly noticeable on gradients. DK CLASSIC CARS welcomes you to a team of dedicated classic car experts. We look forward to working with you to make your wishes and dreams of owning a classic car come true. Our core values are client satisfaction, competence, and passion in what we do. Our goal is to foster long term relationships with our clients and to make sure every client is happy with their new classic car. We stand 100% behind all the cars we sell. We have a large 22,000 square foot showroom with an adjacent workshop, all conveniently located in central Denmark. Please call, click, or stop by for a discussion of your dream car. 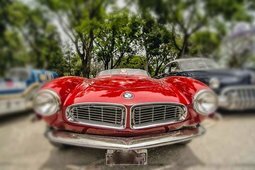 When you decide to collaborate with us on your purchase of a classic car, our team of competent staff will guide you through the process, and our skilled mechanics will inspect and review the car with you. More Vehicles From "DK Classic Cars"